Where do we put our faith, in ourselves? In our job? What does it mean to us, when we go to church? Who is Jesus? How can we have hope, or put our trust in Someone, if we don’t know what that someone means to us? Sadly, all of us, at times, will go to church more out of ritual then wanting to go. Sunday, or late Saturday, means maybe getting dressed a little bit more fashionably, and maybe, not. We gather the kids in the car and we bribe with a promise of a breakfast or dinner out, if the children are good. We sit uncomfortably in the pew, waiting for the Mass to start, or maybe we rush in a few minutes late. We say a hurried prayer, or possibly continue a conversation that was started in the car. The priest walks down the aisle. Some people up near the front sing a hymn or something. We listen, kind of, to the few preliminary readings. Then the big one, the Gospel, is read by the priest (or the deacon). The sermon begins and we sit back into the pew and tend to the children. Our eyes wander, looking at the other people sitting around us. We wonder what they are wondering about. Sometimes we hear a few words of the sermon, and speculate what he is talking about. We then hear more readings from the book, at the center of the altar. The singing, the getting up and down, the Our Father, all begins to run together into an amorphous confused cloud. Pew by pew, we get up and receive a piece of bread. Our thoughts wander from the bread is stiff, to it is like cardboard, to it is stale, to watching the people walk past our pew. Every now and then we think to ourselves, “God what’s wrong with me?” The final blessing is made and we all go back to our homes. Somewhere in our lives, we came to the conclusion that the Mass wasn’t important. Actually, we didn’t understand its importance and rather than try to understand, we decided it was easier to just let it drift away. A decision, made in the past, now erodes the very hope and trust that we so desperately need. That decision, fortunately, is not irreversible. All we need to do is resolve to understand. Read about the Mass and why things are done; read about Christ’s life and His message to all of us; read what our Baptism really signifies and how it empowers us. 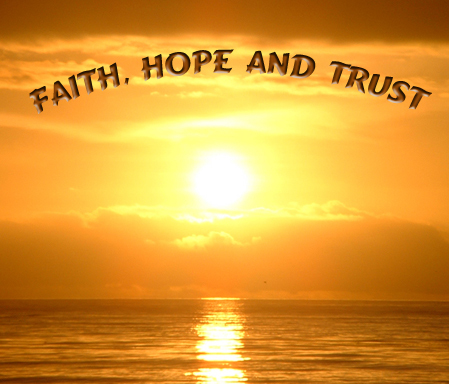 Our Faith tells us it isn’t Hopeless, if we Trust. All we need do is sincerely ask Jesus for guidance and hope and trust will become part of us. « What Are Your Thoughts?